I have a picky two year old, but on of the things he eats well are muffins. So I usually give him a muffin every morning with some fruit and sausage. I have been alternating between two of his favorites: blueberry muffins and poppyseed muffins, which he loves, but I am getting tired of making the the same two muffins all the time, well I am happy to have found another muffin recipe he loves to add to the mix. 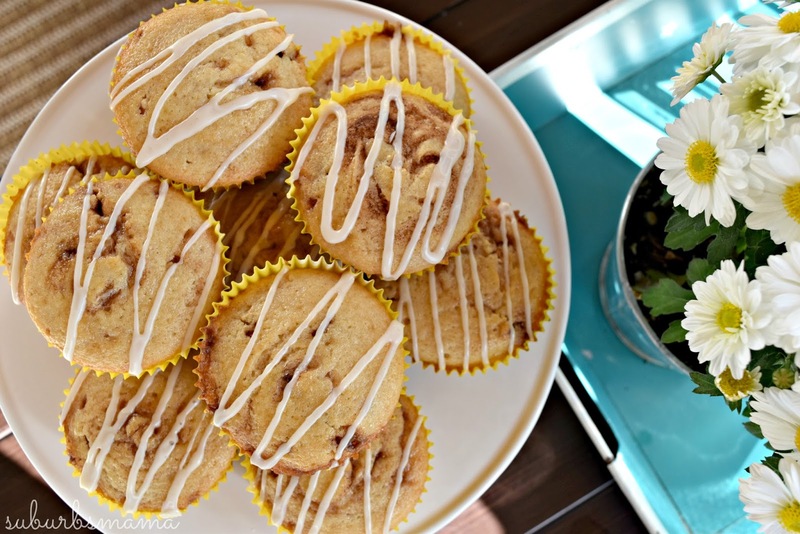 These muffins taste like a cinnamon roll without the trouble of making cinnamon rolls ;). In a glass cup measuring cup or a small bowl, melt the butter. Add cinnamon and brown sugar. The mixture should have the consistency of a thick liquid. Add a small dollop of mixture into each muffin cup (about 1/2 tsp each) and swirl it a few times into the batter with a knife, careful not to let it completely mix. You want the cinnamon sugar mixture to remain as swirls in the batter. You should only use less than 1/2 of your cinnamon sugar mixture for this step, reserving the rest for later. Add remaining muffin batter to muffin cups, covering the swirled mixture. Each muffin tin should be about 2/3 full and you should have enough batter for 12 muffins. Reheat your cinnamon swirl mixture if it has thickened. Add a tiny amount on top of the batter, and swirl with a knife again. Bake for about 20 minutes until muffins are puffy and toothpick inserted into the middle comes out clean. 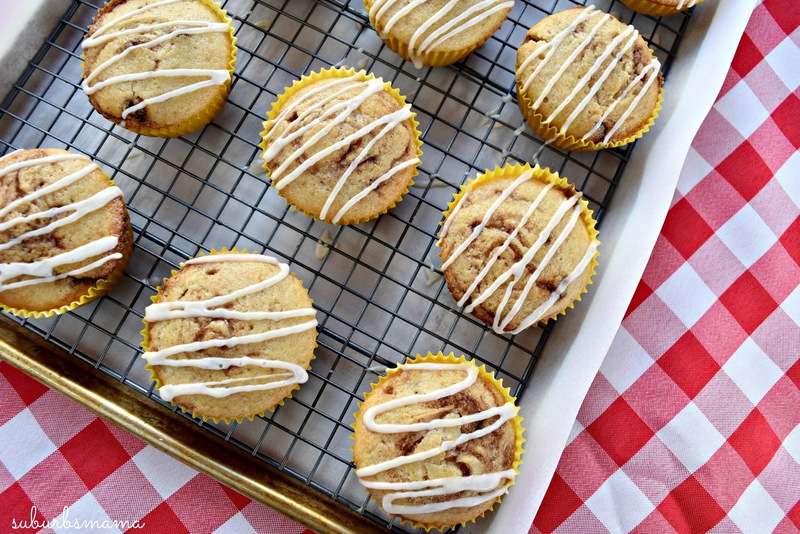 Let muffins cool in the baking pan. While muffins are cooling, make the glaze. In a small bowl, mix powdered sugar, vanilla and 1 tbsp milk. Whisk until smooth. If glaze is too thick, add a little more milk, careful to not add too much at once. Once your glaze reaches the consistency you desire, drizzle on top of muffins. Serve once glaze is set.